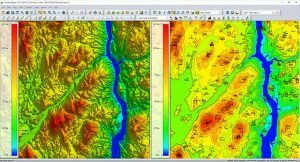 Version 20 of the Global Mapper Software Development Kit (SDK) is now available, along with the accompanying Lidar Module SDK. Mirroring the most important capabilities of the desktop version of the software, the powerful developer’s toolkit provides software engineers with the means to embed the latest geospatial technology into their custom applications, according to software maker Blue Marble Geographics. Among the highlights of the version 20 release are dramatically improved vector data performance in both the 2D and 3D environments, updated 3D mesh rendering with colors now displayed in the 2D view, and faster display and export of online tiled datasets, the company said. For more than 25 years, Blue Marble’s affordable, user-friendly GIS software has been meeting the needs of users in industries including software, oil and gas, mining, civil engineering, surveying and technology companies, as well as government departments and academic institutions. The Global Mapper GIS application can display, convert and analyze virtually any type of geospatial data. The Global Mapper SDK and Lidar Module SDK provide software developers with a toolkit for accessing much of this functionality from within an existing or custom-built application. The SDK also enables the creation of custom toolbars and extensions to enhance the data processing and analysis functionality of the standard version of Global Mapper. This capability allows in-house developers to create a unique version of the application to meet their specific needs or for software companies to build custom products for commercial distribution. The functional highlights of the latest version of the SDK effectively illustrate the continued evolution of 3D GIS technology and Blue Marble’s commitment to providing a superior data processing engine for managing, visualizing and analyzing increasingly large 3D datasets. Such is the case with the improvements that have been made to the display performance of vector files with faster rendering in both 2D and 3D Views. The display of 3D meshes or models, such as those created in Global Mapper’s Pixels-to-Points tool, has been improved with the photo-realistic colors now displayed in the top-down view. Online data processing has also seen improvements with significant speed increases when loading and exporting tiled data sources.